The company was started in the year 1989 and has a built up in finishing area of 37,000 sft. The company is managed by Mr .K. Janarthanan & Mr. N.Sambathkumar having very good technical and commercial expertise with sound experience of 23 years in this field. The core policy of the company is to maintain consistent quality, timely at reasonable cost to the utmost satisfaction of the customer the total team is dedicated towards achieving this goal. Using straight & band knife machines. Our capacity is 10000 Pcs/day supported by investronica cad software. TFGN - 9 x 12 - 1 No (Double Sequence). Tajima imported from japan latest model tfgn 9 x 18, tfgn 6x20 and tfgn 9x12 to make all kinds of embroidery like applique, cording & boring and allover embroidery on fabrics and garments..
a) Plccoting, 12 Needle Drimmer Etc., - 5 Nos. b) Button Hole & Button Stitching Machine - 4 Nos. c) SNAP Fastening Machine - 4 Nos. Smocking stitch machine - variomatic make 1 no. Having a capacity to stitch nearly 300 designs to match the buyers requirements. Needle detector. Best a model: cbs-600 mas conveyor type needle detector. 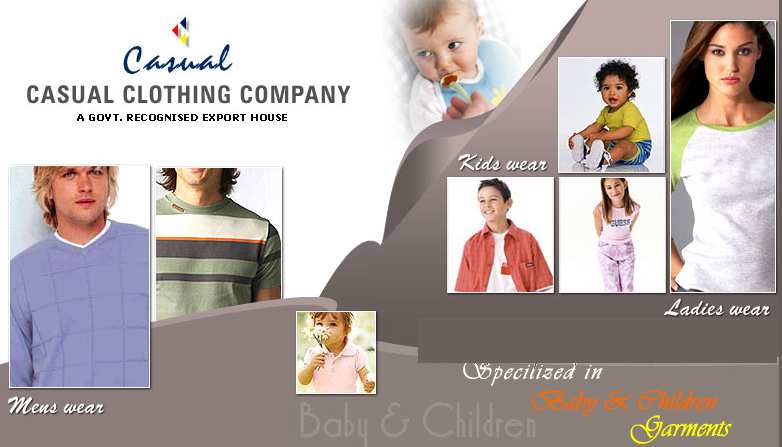 Exporting garments to france, about 20 lac pieces per annum in different styles for babies, boys, girls ladies and mens. Producing garments with in-house designing., as well as per designs of buyers. Producing garments with any fabrics in knits like jersey, fleece, polar fleece, terry, velour, interlocks, loopknit, engineering stripes, ribs... Gsm from 140 to 360. Imported and indigenous accessories are used to meet international requirements. The total casual team is dedicated to offer quality garments at affordable price and at reasonable production lead time of 30-45 days to satisfy the overseas customers.